[S742] The Peerage, online thepeerage.com, http://en.wikipedia.org/wiki/…). Biography*: Charles II, known as "the Lame" (French le Boiteux, Italian lo Zoppo) (1254 – 5 May 1309) was King of Naples, King of Albania, Prince of Salerno, Prince of Achaea, Count of Provence and Forcalquier and Count of Anjou. He was the son of Charles I of Anjou, who had conquered the Kingdom of Naples and Sicily in the 1260s. His mother was Beatrice of Provence. During the Sicilian Vespers, he was captured by Roger of Lauria in the naval battle at Naples in 1284. When his father died in 1285, he was still a prisoner of Peter III of Aragon. In 1288, King Edward I of England mediated to make peace, and Charles was freed on condition that he retain Naples alone. Sicily was left to the Aragonese. Charles was also to induce his cousin Charles of Valois to renounce, for twenty thousand pounds of silver, the kingdom of Aragon, which had been given to him by Pope Martin IV to punish Peter for having invaded Sicily, but which the Valois had never effectively occupied. Charles was then released, leaving three of his sons and sixty Provençal nobles as hostages. He promised to pay 30,000 marks and to return as a prisoner if the conditions were not fulfilled within three years. He then went to Rieti, where the new pope, Nicholas IV, absolved him from all the conditions he had sworn to observe, crowned him King of Sicily in 1289, and excommunicated King Alfonso III of Aragon. Charles of Valois, in alliance with Castile, prepared to take possession of Aragon, reopening the Aragonese Crusade. Alfonso, being hard pressed, agreed to the conditions of the Treaty of Tarascon: he had to promise to withdraw the troops he had sent to help his brother James in Sicily, renounce all rights over the island, and pay a tribute to the Holy See. Alfonso died childless in 1291 before the treaty could be carried out, and James took possession of Aragon, leaving the government of Sicily to the third brother, Frederick. Pope Boniface VIII, elected in 1294 at Naples under the auspices of King Charles, mediated between the latter and James, and the dishonourable Treaty of Anagni was signed: James was to marry Charles’s daughter Bianca and was promised the investiture by the Pope of Sardinia and Corsica, while he was to leave the Angevin a free hand in Sicily and even to assist him if the Sicilians resisted. An attempt was made to bribe Frederick into consenting to this arrangement, but being backed up by his people he refused, and was afterwards crowned King of Sicily. The ensuing war was fought on land and sea, but Charles, though aided by the Pope, his cousin Charles of Valois and James, was unable to conquer the island, and his son the prince of Taranto was taken prisoner at the Battle of La Falconara in 1299. Peace was at last made in 1302 at Caltabellotta. Charles gave up all rights to Sicily and agreed to the marriage of his daughter Eleanor and King Frederick; the treaty was ratified by the Pope in 1303. Charles spent his last years quietly in Naples, which city he improved and embellished. He died in Naples in May 1309, and was succeeded by his son Robert the Wise. [S746] Wikipedia, online http://Wikipedia.com, http://en.wikipedia.org/wiki/Mary_of_Hungary,_Queen_of_Naples. Biography*: Mary of Hungary (c. 1257 – 25 March 1323), of the Árpád dynasty, was Queen consort of the Kingdom of Naples. She was a daughter of Stephen V of Hungary and his wife Elizabeth the Cuman. Mary served as Regent in Provence in 1290–1294 and in Naples in 1295–96, 1296–98, and 1302, during the absences of her consort. Mary's mother followed the Shamanist religion, like other Cumans. She was considered a Pagan by contemporary Christians of Europe and Elizabeth had to convert to Catholicism in order to marry Maria's father, Stephen. It's unknown at what age she chose Christianity, but could be possible that she was already raised as an Orthodox in the Hungarian royal court since her childhood. Mary was the second of six children. Her sisters, Elizabeth and Catherine both became Queen of Serbia. Another sister, Anna married Andronikos II Palaiologos. Mary's only brother was Ladislaus IV of Hungary. Her paternal grandparents were Béla IV of Hungary and his wife Maria Laskarina. Her maternal grandparents could have been Köten, leader of a tribe of Cumans and unknown mother. In 1270, when Mary was only twelve years of age, she married the future Charles II of Naples. The wedding took place in Naples on 6 August 1270. The marriage was intended as a double alliance between Naples and Hungary to support the intended conquest of Byzantium by Naples, but it did not serve its purpose as her brother in 1272 made an alliance with Byzantium as well. Maria accompanied Charles on his trips and spent 1278-82 in Provence with her consort. In 1284, she made her first political act: when Charles was taken captive by Aragon, she made the decision to free the Aragonese prisoner Beatrice of Hohenstaufen. In 1285, Charles became monarch but remained in Aragonese prison. She did not take part in the regency for him in Naples, but remained in Provence, where she did take part in the administration from time to time, though she was not formal regent. In 1288, she took part in the negotiations of her consort's release, and the same year, she made a peace treaty with Aragon. Charles was release the same year, and they returned to Naples together. In 1290-94, she was regent for him in Provence. On 10 July 1290, Mary's brother, Ladislaus IV of Hungary died childless. The question now was who would succeed him: he had four sisters, three of them outlived him, all four had married powerful rulers and all four had their own children. On 21 September 1290, Mary claimed the throne of Hungary. She was up against her two sisters, Catherine and Elisabeth, and their children, plus the children of her younger sister Anna. Mary was crowned Queen by a Papal legate in Naples (1291), but immediately transferred her rights to her eldest son, Charles Martel of Anjou. The Pope confirmed her sole rights in Hungary on 30 August 1295. However, Catherine's son, Stephen Vladislav II of Syrmia, was still a dangerous rival for Mary and Charles Martel. In the end, Charles Martel gave his cousin Slavonia as a compromise. Charles Martel was only titular King of Hungary, it was Mary's grandson who became King, Charles I of Hungary. Ultimately the claims of the sisters Mary and Catherine were united in a common descendant when the pair's great-great-granddaughter, Mary of Hungary, ascended to the Hungarian throne in 1382. When the line of Charles Martel and the Angevins in Hungary died out, it was Sigismund, a remote descendant of Bela IV, whose family succeeded. During 1290, Mary's sister Elisabeth fled from Bohemia with her son because her husband had lost favour and was executed, Mary allowed Elisabeth and her son to stay in Naples with her, before she became a nun, but escaped and remarried to Stephen Uroš II Milutin of Serbia (brother of Catherine's husband) Elizabeth's stay in Naples is documented during July 1300. In 1294, Mary returned with Charles to Naples. She was his representative at the negotiations with the Pope in 1295-96. Between 1296 and 1298, she served as regent of Naples in the absence of her consort. She served as regent the last time in 1302. After this, she lost her influence over states affairs, and retired to pious duties such as to finance convents and churches. Mary's husband died in August 1309. Mary was now a widow. There is no evidence that she became a nun, which has sometimes been rumored, but she did spent a lot of her time in convents. She lived in Naples for the rest of her life, where she died on 25 March 1323. She was buried in Naples at the Santa Maria Donna Regina. Charles Martel (1271 – 1295), titular King of Hungary. Louis (February 9, 1275, Nocera – August 19, 1298, Chateau de Brignoles), Bishop of Toulouse, later canonized. 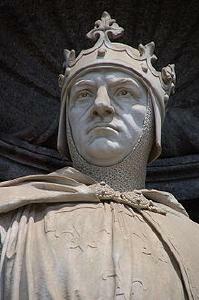 Robert I (1277 – 1343) King of Naples. Philip I (1278 – 1331) Prince of Achaea and Taranto, Despot of Romania, Lord of Durazzo, titular Emperor of Constantinople. Raymond Berengar (1281 – 1307), Count of Provence, Prince of Piedmont and Andria. John (1283 – aft. March 16, 1308), a priest. Tristan (1284 – bef. 1288). John (1294 – April 5, 1336, Naples), Duke of Durazzo, Prince of Achaea, and Count of Gravina, married March 1318 (divorced 1321) Matilda of Hainaut (November 29, 1293 – 1336), and married secondly November 14, 1321 Agnes of Périgord (d. 1345). Margaret (1273 – December 31, 1299), Countess of Anjou and Maine, married at Corbeil August 16, 1290 Charles of Valois, brother of king of France, and became ancestress of the Valois dynasty. 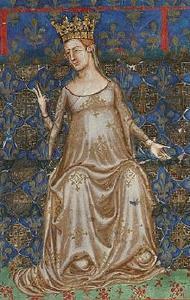 Blanche (1280 – October 14, 1310, Barcelona), married at Villebertran November 1, 1295 James II of Aragon. Eleanor, (August 1289 – August 9, 1341, Monastery of St. Nicholas, Arene, Elis), married at Messina May 17, 1302 Frederick III of Sicily. Maria (1290 – c. 1346), married firstly at Palma de Majorca September 20, 1304 Sancho I of Majorca, married secondly 1326 Jaime de Ejerica (1298 – April 1335). Biography*: Charles I (21 March 1227 – 7 January 1285), known also as Charles of Anjou, was the King of Sicily by conquest from 1266, though he had received it as a papal grant in 1262 and was expelled from the island in the aftermath of the Sicilian Vespers of 1282. Thereafter, he claimed the island, though his power was restricted to the peninsular possessions of the kingdom, with his capital at Naples (and for this he is usually titled King of Naples after 1282, as are his successors). Charles was the youngest son of Louis VIII of France and Blanche of Castile, and hence younger brother of Louis IX of France and Alfonso II of Toulouse. He conquered the Kingdom of Sicily from the Hohenstaufen and acquired lands in the eastern Mediterranean. However, the War of the Sicilian Vespers forced him to abandon his plans to reassemble the Latin Empire. By marriage to Beatrice of Provence, heiress of Raymond Berengar IV of Provence, he was Count of Provence and Forcalquier from 1246. In 1247, his brother Louis IX made him Count of Anjou and Maine, as appanages of the French crown. By conquest and self-proclamation, he became King of Albania in 1272 and by purchase King of Jerusalem in 1277. By the testament of William II of Villehardouin, he inherited the Principality of Achaea in 1278. Charles was born in March 1227, four months after the death of his father, King Louis VIII. Like his immediate older brother, Philip Dagobert, he did not receive a county as appanage, as had their older brothers. In 1232, his brothers Philip Dagobert and John, Count of Anjou and Maine, died. Charles became the next in line to receive the Counties, but was formally invested only in 1247. The affection of his mother Blanche seems largely to have been bestowed upon his brother Louis, and Louis tended to favour his other younger brothers, Robert of Artois and Alphonse of Toulouse. The self-reliance this engendered in Charles may account for the drive and ambition he showed in later life. Upon his accession as Count of Provence and Forcalquier in 1246, Charles rapidly found himself in difficulties. His sisters-in-law felt cheated by their father's will, and his mother-in-law, the Dowager Countess Beatrice of Savoy, claimed the entire county of Forcalquier and the usufruct of Provence as her jointure. Furthermore, while Provence was technically a part of the Burgundy and hence of the Holy Roman Empire, in practice it was free of central authority. Recent counts had governed with a light hand, and the nobilities and cities had enjoyed great liberties. Three cities, Marseille, Arles, and Avignon were Imperial cities technically separate from the county. Charles was disposed toward rigid administration; he ordered inquests in 1252 and again in 1278 to ascertain his rights Charles broke the traditional powers of the major towns (Nice, Grasse, Marseille, Arles, Avignon) and aroused considerable hostility by his punctilious insistence on enjoying his full rights and fees. In 1247, while Charles was in France to receive the counties of Anjou and Maine, the local nobility (represented by Barral of Baux and Boniface of Castellane) joined with Beatrice and the three Imperial cities to form a defensive league against him. Unfortunately for Charles, he had promised to join his brother on the Seventh Crusade. For the time being, Charles compromised with Beatrice, allowing her to have Forcalquier and a third of the Provençal usufruct. Rich Provence provided the funds that supported his wider career. His rights as landlord were, on the whole, of recent establishment, but his rights as sovereign entitled him to revenues on the gabelles (mainly salt), from alberga (commutation of gîte) and cavalcata (commutation of the duties of military service) and quista ("aids") (Baratier 1969). From the Church, unlike his brothers in the north, he received virtually nothing. Charles' agents were efficient, the towns were prosperous, the peasants were buying up the duties of corvée and establishing self-governing consulats in the villages: Provence flourished. Charles sailed with the rest of the Crusaders from Aigues-Mortes in 1248 and fought at Damietta and in the struggle around Mansourah, Egypt. However, his piety does not seem to have matched that of his brother (Jean de Joinville, according to a tale about Louis catching him gambling on the voyage from Egypt to Acre), and he returned with his brother Alphonse in May 1250. During his absence, open rebellion had broken out in Provence. Charles moved to suppress it, and Arles, Avignon, and Barral of Baux had surrendered to him by June 1251. Marseille held out until July 1252, but then sued for peace. Charles imposed a lenient peace, but insisted on the recognition of his full rights, and acknowledgement of his suzerainty by Marseille. In November 1252, the death of his mother Blanche of Castile caused him to go north to Paris and assume the joint regency of the kingdom with his brother Alphonse. While in Paris, he was approached by envoys from Pope Innocent IV. Innocent was then seeking to detach the Kingdom of Sicily from the Holy Roman Empire (in the person of Conrad IV of Germany), and offered it to Charles, after his brother-in-law Richard, Earl of Cornwall had declined it. Alphonse, however, was cool to the idea; and King Louis forbade it outright. Balked, Charles took up the cause of Margaret II of Flanders against her son, John I, Count of Hainaut, in the War of the Succession of Flanders and Hainault. She granted him the County of Hainaut for his service. King Louis again disapproved, and on his return from Outremer in 1254 he returned Hainaut to John. Disappointed, Charles returned to Provence, which had become restive again. The mediation of King Louis led to a settlement with Beatrice of Savoy, who returned Forcalquier and relinquished her claims for a cash payment and a pension. Marseille had attempted to involve Pisa and Alfonso X of Castile in the quarrel, but they proved unreliable as allies, and a coup by the supporters of Charles resulted in the surrender of the city's political powers. Charles spent the next several years quietly increasing his power over various lordships on the borders of Provence. A final rebellion occurred in 1262, when he was absent in France; Boniface of Castellane rebelled yet again, as did Marseille and Hugh of Baux. However, Barral of Baux now remained loyal to Charles, and Charles quickly returned to scatter the rebels. The mediation of James I of Aragon brought about a settlement; while Marseille was forced to dismantle its fortifications and surrender its arms, it otherwise went unpunished. Surprisingly, this leniency worked to good effect; hereafter, the Provençals proved staunch supporters of Charles, providing money and troops for his further conquests. Many of them were to be rewarded with high posts in his new dominions. With the usurpation of the Sicilian throne from Conradin by Manfred of Sicily in 1258, the relationship between the Papacy and the House of Hohenstaufen changed again. Instead of the boy Conradin, safely sequestered across the Alps, the Papacy now faced an able military leader in Italy. Accordingly, when negotiations broke down with Manfred in 1262, Pope Urban IV again took up the scheme of disseising the Hohenstaufen from the kingdom, and offered the crown to Charles again. Manfred's own usurpation from Conradin told upon King Louis' scruples; this time, he was persuaded to admit the offer, and Charles ratified a treaty with the Pope in July 1263. The terms were heavily in favor of the Pope; the kingdom must never be re-united with the Empire, and the king was never to hold Imperial or Papal office, or interfere with ecclesiastical matters in the kingdom. Nevertheless, Charles accepted eagerly. For money, he called for help from the then-omnipotent Sienese banker Orlando Bonsignori. Charles' cousin, Henry of Castile (the Senator), lent him forty thousand ounces of gold to finance the war against King Manfred. This loan was never repaid. Henry of Castile, angered by Charles' disregard, changed sides to Conradin's and fought with a host of Spanish knights against Charles in Tagliacozzo. Defeated, Henry was imprisoned by Charles for 22 years in Canosa di Puglia and Castel del Monte, where he wrote the famous novel of chivalry, Amadis de Gaula. Having endorsed the treaty, Charles could play for time. As Manfred's troops advanced on the Papal States, Charles renegotiated the treaty on more favorable lines. As instructions went out to the clergy to submit contributions for the war, Urban IV died in October 1264 at Perugia, fleeing Manfred. This raised the possibility of a reversal of papal policy. To underscore his resolve, Charles broke sharply with his previous policy of leniency and ordered the execution of several Provençal rebels who had been in his hands for a year. Fortunately for Charles, the new Pope Clement IV was the former adviser to his brother Alphonse and strongly supported the accession of Charles. Charles entered Rome on 23 May 1265 and was proclaimed King of Sicily. Charles was popular in Rome, where he was elected sole Senator, and his diplomacy had already undermined Manfred's support in northern Italy. While Charles' campaigns were delayed for lack of money, Manfred, curiously, idled away his time hunting in Apulia, while his support in the north of Italy waned. Charles was able to bring his main army through the Alps, and he and Beatrice were crowned on 6 January 1266. As Charles' army began an energetic campaign, Manfred suddenly shed his lethargy and moved to meet him. Worried that further delays might endanger the loyalty of his supporters, he attacked Charles' army, then in disarray from the crossing of the hills into Benevento, on 26 February 1266. In the Battle of Benevento that followed, Manfred's army was defeated and he was killed in the melee. Upon his death, resistance throughout the kingdom collapsed, and Charles became master of Sicily. While Charles' administration in his new kingdom was generally fair and honest, it was also stringent. As in Provence, he insisted on maximizing the revenues and privileges he obtained from his new subjects. Discontent was high, but for now, Charles could focus on extending his power in northern Italy (which alarmed the Pope, who feared a powerful king of all Italy as much as he did an emperor). But the Pope was willing to allow this, for in September 1267 Conradin marched south to reclaim the rights of the Hohenstaufen, and one of his agents instigated a revolt in Sicily. He entered Rome on 24 July 1268, where his arrival was wildly celebrated. At the Battle of Tagliacozzo, on 23 August 1268, it appeared he might win the day, but a sudden charge of Charles' reserve discomfited Conradin's army and he was forced to flee to Rome. Told it was no longer safe, he attempted to escape to Genoa, but was arrested and imprisoned in the Castel dell'Ovo in Naples. In a trial carefully managed by Charles, Conradin was condemned for treason and beheaded on 29 October 1268 at the age of 16. By the end of 1270, Charles had captured Lucera and put down the revolt in Sicily, executing many of the captured. With the whole kingdom cowed beneath his strict, if fair, rule, he was ready to consider greater conquests. After the defeat of Manfred at Benevento, Charles immediately began to plan his expansion into the Mediterranean. Historically, the Kingdom of Sicily had at times controlled parts of the eastern Adriatic seaboard, and Manfred possessed the island of Corfu and the towns of Butrinto, Avlona and Suboto, which had formed the dowry of his wife Helena. Charles seized these at the end of 1266. From thence, he passed on to intrigue with the remaining nobility of the Latin Empire. In May 1267, he concluded the Treaty of Viterbo with the exiled Baldwin II of Constantinople and William II Villehardouin (through his chancellor Leonardo of Veruli). Taking advantage of the precarious situation of the remains of the Empire in the face of rising Greek power, he obtained confirmation of his possession of Corfu, the suzerain rights over Achaea, and sovereignty over most of the Aegean islands. Furthermore, the heirs of both the Latin princes were to marry children of Charles, and Charles was to have the reversion of the Empire and principality should the couples have no heirs. With few options to check the Byzantine tide, he was well placed to dictate terms. Charles' wife Beatrice died on 23 September 1267, and he immediately sought a new marriage to Margaret, daughter of Béla IV of Hungary. However, Margaret wished to be a nun (and was later canonized); Charles instead married (on 18 November 1268), Margaret, Countess of Tonnerre (1250 – 4 September 1308, Tonnerre), the daughter of Eudes of Burgundy. However, he was able to make a marital alliance with the Hungarians: his son Charles, Prince of Salerno, married Maria, daughter of crown prince Stephen, while Charles' daughter Elizabeth married Stephen's son Ladislas. Having thus secured his position in the east, he began to prepare a crusade to recover the Latin Empire. Michael VIII Palaeologus was greatly alarmed at the prospect: he wrote to King Louis, suggesting that he was open to a voluntary union of the Latin and Greek churches, and pointing out the interference a descent on Constantinople would pose to Louis' own Crusades. Louis took a dim view of his sincerity; but he was eager to take up the cross again, and he notified Charles of his intentions. Charles continued with his preparations against Constantinople, hoping the Crusade might be postponed, but he also prepared to turn his brother's Crusade to his own advantage. The Caliph of Tunis, Muhammad I al-Mustansir, had been a vassal of Sicily, but had shaken off his allegiance with the fall of Manfred. However, there were rumors he might be sympathetic to Christianity. Accordingly, Charles suggested to his brother that the arrival of a Crusade in his support might bring about Mustansir's conversion. Thus it was that Louis directed the Eighth Crusade against Tunis. Charles did not arrive until late in the day on 25 August 1270, only to find that his brother had died of dysentery that morning. Charles took command, and after a few skirmishes, Mustansir concluded a peace treaty and agreed to pay tribute to Charles. Illness continued to plague the army, however, and a storm devastated the fleet of 18 men-of-war and innumerable smaller vessels as it returned to Sicily. Charles was again forced to postpone his designs against Constantinople. In February 1271, Charles expanded his Adriatic possessions by capturing Durazzo, and soon controlled much of the Albanian interior. In February 1272, he proclaimed himself King of Albania and appointed Gazzo Chinardo as his vicar-general. He hoped to take up his expedition to Constantinople again, but was delayed by the election of Pope Gregory X, consecrated on 27 March 1272. Gregory hoped to reconcile Europe, unifying the Greek and Latin churches, and launch a new Crusade. To that end, he announced the Council of Lyon, to be held in 1274, and worked to arrange the election of an emperor. In November 1272, strained relations between Charles and Ghibelline-ruled Genoa finally broke into war. Ghibelline revolts broke out across the north of Italy, and increasingly occupied the attention of Charles, even as Michael Palaeologus was negotiating a union of churches with the Pope. At the same time, he made contact with Genoa and sent money to encourage revolts in the north. At the apparently successful conclusion of the Council of Lyon, a Union of Churches was declared, and Charles and Philip of Courtenay were compelled to extend a truce with Michael. This was a blessing in disguise for Charles, for the Ghibellines now controlled most of the north, and he was forced to retreat from Piedmont in late 1275. In truth, Pope Gregory was not entirely displeased; he regarded north Italy as best dealt with by its new emperor, Rudolph of Habsburg, and preferred that Charles be confined to the south. If he wished to make war, let him look to Outremer. To this end, Gregory endorsed the sale to Charles of the claims of Maria of Antioch on the Kingdom of Jerusalem, which had been rejected by the Haute Cour there. On 18 March 1277, he bought her claim and assumed the title of King of Jerusalem, sending Roger of San Severino as his bailli to Acre. There Roger ousted Balian of Arsuf, the bailli of Hugh III, and compelled the nobles to swear fealty. In the meantime, Gregory had been succeeded by Pope Innocent V, who arranged a peace between Charles and the Genoese. Meanwhile, in Constantinople, the Union of the Churches was proving difficult to arrange, and the Emperor Michael had great difficulty in imposing it on his people. Nevertheless, he persuaded Innocent of his sincerity in working towards it, and Charles was again forbidden to attack Constantinople. Knowing this, Michael began a campaign in Albania in late 1274, where he captured Berat and Butrinto. He also enjoyed some success in his campaigns in Euboea and the Peloponnese. Affairs dragged on for several years, until the accession of Pope Martin IV on 23 March 1281. Pope Martin was a Frenchman, and lacked the even-handedness of some of his recent precursors. He brought the full power of the Papacy into line behind Charles' plans. The Union, which had proved impossible to impose upon Constantinople, was called off, and Charles was given authorization for the restoration of the Latin Empire. He opened his campaign in Albania, where his general Hugh the Red of Sully with 8,000 men (including 2,000 cavalry) captured Butrinto from the Despotate of Epirus in 1280 and besieged Berat. A Byzantine army of relief under Michael Tarchaneiotes arrived in March 1281: Hugh of Sully was ambushed and captured, and his army put to flight. The Byzantines took possession of the interior of Albania. Nor was Charles particularly successful in Achaea, where he had become (by the Treaty of Viterbo) Prince of Achaea on the death of William II Villehardouin in 1278. His bailli Galeran of Ivry was defeated at Skorta in his one attempt to engage the Byzantines, and was recalled in 1280 and replaced by Philip of Lagonesse. Nonetheless, Charles was to launch the body of his Crusade (400 ships carrying 27,000 mounted knights) against Constantinople in the spring of 1282. But Michael had not been working upon the military front alone. Many Ghibelline officials had fled the Kingdom of Sicily to the court of Peter III of Aragon, who had married Constance, the daughter and heir of Manfred. Manfred's former chancellor, John of Procida, had arranged contact between Michael, Peter and the refugees at his court, and conspirators on the island of Sicily itself. Peter began to assemble a fleet at Barcelona, ostensibly for another Crusade to Tunis. In fact, the master-plan of John of Procida was to place Peter on the throne of Sicily, his Hohenstaufen inheritance. The result was the uprising known as the Sicilian Vespers, which was initiated in Palermo on 29 March 1282. It rapidly grew into a general massacre of the French in Sicily. A few officials notable for their good conduct were spared, and the city of Messina still held for Charles. But through the diplomatic errors of Charles' vicar, Herbert of Orléans, Messina, too, revolted on 28 April 1282. Herbert retreated to the castle of Mategriffon, but was forced to abandon the Crusader fleet, which was burnt. The news surprised Peter of Aragon, who had expected to intervene only after Charles had left for Constantinople. But the conspirators, aided by Emperor Michael (who wished to see Charles balked in his expedition), had set the revolt in motion early. Peter did not immediately intervene; he sailed with the fleet to Tunis, where he discovered that the would-be convert on whose behalf the Crusade had ostensibly been undertaken had been caught and executed. While he bided his time, the Sicilians made an appeal to Pope Martin to take the Communes of their cities under his protection. But Martin was far too deeply committed to Charles and French interests to heed them; instead, he excommunicated the rebels, Emperor Michael, and the Ghibellines in north Italy. Charles gathered his forces in Calabria, landed near Messina, and began a siege. Several attempts to assault the city were unsuccessful. Rejected by the Pope, the Sicilians now appealed to King Peter and Queen Constance; he duly accepted, and landed at Trapani on 30 August 1282. He was proclaimed king in Palermo on 4 September, but as the archibishopric of Palermo was vacant, he could not immediately be crowned. In the face of the Aragonese landing, Charles was compelled to withdraw across the Straits of Messina into Calabria in September, but the Aragonese moved swiftly enough to destroy part of his army and most of his baggage. The Angevin house was forever ousted from Sicily. Despite his retreat into Calabria, Charles remained in a strong position. His nephew, Philip III of France, was devoted to him and Pope Martin regarded the rebellion as an affront both to French interests and his own rights as suzerain of the kingdom. Both sides temporized; the expense of a long war might be disastrous for both, and Peter and Charles arranged for a judicial duel, with a hundred knights apiece, on 1 June 1283 at Bordeaux. Skirmishes and raids continued to occur: in January 1283, Aragonese guerillas attacked Catona and killed Count Peter I of Alençon in his hostel. In February the Aragonese crossed into Calabria to face off with Charles of Salerno. However, tensions between the Aragonese and the Sicilians had begun to rise. Both men now hoped to turn the war to their advantage, and the judicial duel turned into a farce, the two kings arriving at different times, declaring a victory over their absent opponent, and departing. Now the war escalated: Pope Martin had excommunicated Peter and proclaimed war against the Sicilians and a Crusade in January, and in March declared Peter to be deprived of his dominions. On 2 February 1284, Aragon and Valencia were officially conferred upon Charles of Valois. The war continued in Italy: while little progress had been made in Calabria, a detachment of the Aragonese fleet was blockading Malta. Charles of Salerno sent a newly raised Provençal fleet to the relief of Malta, but it was caught by the main Aragonese fleet under Roger of Lauria and destroyed in the Battle of Malta. The Aragonese were now, however, running quite short of money, and Peter was threatened by the prospect of a French attack on Aragon. King Charles planned to raise new troops and a fleet in Provence, and instructed Charles of Salerno to maintain a strict defensive posture until his return from France. However, Roger of Lauria continued to command the sea and launch harassing raids up and down the coast of Calabria, and in May 1284 he successfully blockaded Naples, basing a small squadron on the island of Nisida to do so. The Neapolitans were infuriated by the blockade, and in June Charles of Salerno armed the newly launched fleet at Naples and embarked on 5 June to destroy the blockading squadron. Evidently believing the main Aragonese fleet was raiding down the coast, he hoped to destroy the blockading squadron and return to Naples before it returned. However, Roger of Lauria had learned of his plans, and Charles found himself engulfed by superior numbers. After a short, sharp, fight, most of his fleet was captured, and he himself was taken prisoner. News of the reverse caused anti-French riots in Naples, and Roger of Lauria was quick to take advantage of Charles' captivity to obtain the release of Beatrice, daughter of Manfred of Sicily, then held in Naples. King Charles arrived in Gaeta on 6 June and learned of the disaster. He was furious at his son and his disobedience; by the time he reached Naples, the riots had been quelled. He advanced on Calabria and attempted a landing in Sicily, but his main army was blocked at Reggio, and he retreated from Calabria entirely on 3 August. He continued to make preparations for a campaign against Sicily in the new year; but his health failed. On 7 January 1285 he died in Foggia. On his death, Charles left all of his domains to his son Charles, then a prisoner in Catalonia. For the time being, these were held in joint regency by a papal legate and Robert II of Artois. Charles spent his life striving to assemble a Mediterranean empire out of whatever land he could get through law or force of arms. He did so, it seems, with a clear conscience; he regarded himself as God's instrument to uphold the Papacy and punish the Hohenstaufen. He ruled justly, but with the rigidity and severity that might be expected in one of his convictions. Ultimately, his unbending austerity could not inspire the devotion needed to hold his conquests together. Still, he left a substantial legacy to his heirs. Henry II of Cyprus reclaimed the Kingdom of Jerusalem after his death, for the few years left to it, but his other possessions remained with the Angevin dynasty he founded, or its descendants. Both the Angevins and their Aragonese rivals were to claim the title of "King of Sicily"; but the Angevins, confined to the mainland, would be known to history as "Kings of Naples". But the style of "King of Sicily" persisted, and when the two realms were reunited it was under the style of "King of the Two Sicilies". Charles of Anjou contributed to the early medieval revival of learning, often referred to as the "Latin" Renaissance, by employing several Jewish scholars at the Universities of Salerno and Naples who were expert translators. The most famous of these, Moses of Palermo, he had tutored in Latin, to enable him to make direct translations of ancient classical and Arab texts. These Jewish scholars translated dozens of philosophical and medical treatises into Latin, bringing the heritage of classical antiquity and the great contemporary Muslim culture to pre-Renaissance Europe. However, Charles' wars resulted in even more serious consequences than the partition of the Kingdom of Sicily. Pope Martin IV hopelessly compromised the papacy in his cause; and the botched secular "Crusades" against Sicily and (after Charles' death) Aragon greatly tarnished its spiritual power. The collapse of its moral authority and the rise of nationalism rang the death knell for crusading, and would ultimately lead to the Avignon Papacy and the Western Schism. Charles was an able soldier and a good administrator, but his failure to understand the qualities of his diverse subjects, and his grasping, if pious, ambition, ultimately led him to failure. In the Divine Comedy Dante sees Charles outside the gates of Purgatory "singing in accord" with his former rival, Peter. Biography*: Beatrice of Provence (c. 1231 – 23 September 1267) was Countess of Provence and Forcalquier. She was also a Queen consort of Sicily by marriage to King Charles I of Sicily. The youngest daughter of Raymond Berenguer IV of Provence and Beatrice of Savoy, Beatrice was married on 31 January 1246 to Charles of France, Count of Anjou and Maine, the youngest brother of King Louis IX of France. In 1248, Beatrice accompanied her husband on the Seventh Crusade, and gave birth to her first child in Nicosia. In 1266, Charles was crowned king, making her the Queen of Sicily. Ramon Berenguer IV, Count of Provence and Forcalquier, had four daughters, but no sons. His eldest daughter, Margaret, was Queen of France as the wife of Louis IX; his second daughter, Eleanor, was Queen of England as the wife of Henry III, and his third, Sanchia, was titular Queen of Germany as the wife of Henry's brother Richard, Earl of Cornwall. 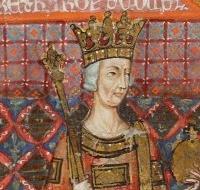 King Louis IX's marriage to Margaret had been arranged by his mother, Blanche of Castile, with the hopes that he would inherit Provence and Forcalquier when Ramon Berenguer died. He, however, left everything to Beatrice, making her Countess of Provence in her own right. Frederick II, dispatched the imperial navy to Provence to ensure Beatrice marry one of his progeny and James I of Aragon, in the hopes of uniting Provence and Toulouse, had planned to marry Beatrice, but when her father died the French court intervened, by getting Pope Innocent IV to refuse the marriage. When Ramon Berenguer died on 19 August 1245, he left Provence to his youngest daughter, and his widow was granted the usufruct of the county of Provence for her lifetime. Beatrice then became one of the most attractive heiresses in medieval Europe. Frederick II, Holy Roman Emperor, sent a fleet and James I of Aragon sent an army to seize her, so her mother placed herself and Beatrice in a safe fortress in Aix, secured the trust of its people then sent to the Pope for his protection. The Pope was also a target for Frederick's military incursions in France. In Cluny during December 1245, a secret discussion, between Pope Innocent IV, Louis IX of France, his mother Blanche of Castile, and his brother Charles of Anjou, took place. It was decided that in return for Louis IX supporting the Pope militarily, the Pope would allow Charles of Anjou, youngest brother to the French King, to marry Beatrice of Provence. Mother and daughter were satisfied with this selection. But Provence was to never go to France outright through Charles. It was agreed that if Charles and Beatrice had children, the county would go to them; if there was no issue, then the county would go to Sanchia of Provence. If Sanchia died without an heir, Provence would go to the King of Aragon. Henry protested the selection, arguing that he had not yet received the full dowry for Eleanor nor his brother for Sanchia. He also still had the castles in Provence against the loan he had made to the former count. Charles, along with Philip of Savoy and five hundred knights, rode from Lyon to Provence. On their way, they ran into Raymond VII Count of Toulouse, who also had an army on the way to Provence. However, Raymond of Toulouse had been deceived by knights in favour of Charles and for that reason he had brought fewer men, and Charles and his army were quicker. When Charles got to Aix-en-Provence, James I of Aragon, who had been there all along but was not allowed to see Beatrice, had his soldiers surrounding the castle in which the young Beatrice and her mother were. There was a brief struggle, but the King of Aragon retreated with dignity. To the young Beatrice, Charles, who was described as "an admirable young man", was a satisfactory resolution to her problems. The marriage took place in 31 January 1246, in Aix-en-Provence. They had soldiers on guard and the bride was escorted down the aisle by her uncle, Thomas. As soon as Charles became Count of Provence, he brought in his own team of French lawyers and accountants. He excluded his mother-in-law Beatrice of Savoy from the running of the county and began taking castles, power and fees away from the nobles who had previously enjoyed a certain degree of independence in the running of their cities. Charles made himself very unpopular. Beatrice of Savoy moved herself to Forcalquier in protest, and in Marseille, Charles's officials were thrown out of the city. In the family conflict the younger Beatrice sided with her husband. In May 1247, Charles and Beatrice were recorded as being in Melun, where Charles was knighted by his brother Louis. Beatrice accompanied Charles on the seventh crusade in 1248. Led by Louis IX, the crusaders made an extended procession through France. Before they left, Charles and Beatrice met with her mother in Beaucaire to try to come to some terms of agreement concerning Provence. Whilst the more important matters were left until Charles and Beatrice returned, it was decided that Beatrice of Savoy would give up the rights to "the castle at Aix in exchange for a percentage of the county's revenue." In Nicosia Beatrice gave birth to her first child, "a very elegant and wellformed son", as her brother-in-law Robert of Artois wrote home to his mother the Queen. Beatrice stayed with her sister Margaret in Damietta, when they lost contact with the King and his army, here Beatrice gave birth to her second child; her sister Margaret too gave birth while in Damietta. Later in 1250, they were reunited with the rest of the crusade at Acre, where the King's ransom was paid. Charles and Beatrice, along with several other nobles, left soon after and journeyed to the court of Emperor Frederick II, to ask him to send the King of France more men for his crusade. However, Frederick, who had been excommunicated, needed his army to fight the Pope, and refused. Charles and Beatrice were then forced to go to Lyon to meet with the Pope. By the time they returned to Provence in 1250, open rebellion had broken out, spurred on by Beatrice's mother, who felt Charles had failed to respect her claims in Provence. By July 1252 Charles had managed to defeat the revolt and was in the process of exercising his power as Count of Provence. However, in November of the same year, Blanche of Castile, regent of France while her son Louis IX was on crusade, died. Charles and Beatrice had to go to Paris, where Charles became co-regent of France with his brother, Alphonse. The Pope offered Charles the Kingdom of Sicily in 1252, but Charles had to turn the offer down, as he was preoccupied with other affairs and he also did not have sufficient funds. The crusaders returned in 1254. Charles and Beatrice spent Christmas in Paris that year, where all of Beatrice's sisters and their mother were present; it was noted that the other four women treated the younger Beatrice coldly, due to Raymond Berenguer's will. Beatrice's sister Margaret, the new Queen of France, publicly offended her in 1259, by not seating her at the family table; she claimed because Beatrice was not a queen like her sisters, she could not sit with them. Margaret had hoped to provoke her sister in treacherous behaviour so she would have a valid reason to invade Provence. Beatrice "with great grief", went to Charles and he reportedly told her: "Be at peace, for I will shortly make thee a greater Queen than them". Beatrice, to aid [Charles] in the gratification of her ambition, sold all her jewels and personal ornaments, and expended her private treasure in collecting round her standard, not only her own vassals, but the chivalric youth of France, who were attracted to her service not less by her personal solicitations than by her rich gifts. Charles went first to Rome, and Beatrice followed with the remaining army through the treacherous Alpine passes, during autumn. It took them nearly six weeks to reach Rome, but once both Charles and Beatrice were in Rome, they were crowned King and Queen of Sicily on 6 January 1266 by five cardinals sent by the Pope (who was sheltering in Perugia). As soon as the coronation festivities had ended, Beatrice stayed in Rome with a small force to hold the city, whilst Charles rode out to the battle of Benevento. After her husband's victory, she chose the castle of Melfi as their residence. Blanche (1250 – July 1269), married in 1265 Robert III of Flanders (1249–1322), by whom she had a son, Charles, who died young. Beatrice (1252–1275), married in 1273 Philip of Courtenay (1243–1283), titular emperor of Constantinople, by whom she had one daughter, Catherine I of Courtenay, titular Empress of Constantinople. Charles II of Naples (1254–1309), Count of Anjou and Provence, King of Naples, married Maria Arpad of Hungary, by whom he had issue. English Queen consort Philippa of Hainaut descended from their daughter, Marguerite of Anjou and Maine. Isabella (Elisabeth) (1261–1300), married to Ladislaus IV of Hungary (1262–1290). Their marriage was childless. Their descendants included;Yolande of Aragon, Philippa of Hainaut, Isabella I of Castile, Henry VIII of England, Caroline of Ansbach, Queen Victoria and Elizabeth II of Great Britain. Beatrice died at Nocera Inferiore in 1267, a little over a year after becoming queen. The cause of her death was not recorded. She was initially buried at Nocera, but Charles later moved her body to Aix-en-Provence where she was laid to rest with her father. Biography*: Alexander Seton, 1st Earl of Huntly (died 15 July 1470), who adopted the family name of Gordon from about 1457, was a powerful 15th-century Scottish magnate. He was knighted in 1439/1440 and was Lord of Badenoch, Gordon, Strathbogie and Cluny. He was the son of Alexander Seton, Lord Gordon (died 1440) (2nd son of Sir William Seton of that Ilk), by his spouse Elizabeth Gordon (died 16 March 1439), daughter and heiress of Sir Adam Gordon of that Ilk. In 1435 he accompanied the princess Margaret to France to marry the 9th Dauphin of France. In a charter dated 23 February 1439–40, he is styled Sir Alexander Seton of Tullibody, heir of Elizabeth Gordon. The charter confirmed an earlier exchange of lands between Sir William Keith and Margaret Fraser (his maternal grandparents) and William Lindsay, Lord of Byres exchanging lands for that of Dunottar. He succeeded his father as Lord Gordon before April 1441. Alexander then resigned his lands to the king on 3 April 1441 and in return was granted a charter to himself and his wife Elizabeth of the lordships of Gordon, county Berwick; Strathbogie, Aboyne, Glentanner and Glenmuick, in Aberdeenshire; and Panbride in county Forfar; to be held in liferent and by their son George Gordon in fee as well as his lawful male heirs. c.?1445 Alexander was raised to the peerage, created the first Earl of Huntly by king James II of Scotland, sometime before 3 July of that year when he witnessed a charter to James Hamilton, 1st Lord Hamilton under that title. Later in the year he was present at the gates of Arbroath Abbey when the Ogilvies and Lindsays were disputing their claims to the office of justiciary of that abbey; where the Ogilvies were defeated and Earl Alexander, there in support of that family, had to flee the field himself. He was embroiled in struggles against the Douglases, against the Lords of the Isles, and against the Lindsay earls of Crawford while being closely aligned with William Crichton, the Chancellor. On 28 April 1451 he received a charter from the king of the lordship of Badenoch and the castle of Ruthven. Gordon fought on the King's side against the Douglases during The Douglas Rebellion and soundly defeated the Crawfords at the Battle of Brechin 18 May 1452. Huntly adopted the family name of Gordon about 1457. He died on 15 July 1470 at Huntly Castle and was buried in Elgin Cathedral. Alexander Seton, ancestor of the Setons of Touch, and Abercorn; succeeded to his mother's lands. Margaret Gordon, before 9 November 1457 contracted to marry Nicholas Hay, 2nd Earl of Erroll but for some reason did not and he married her sister Elizabeth. [S746] Wikipedia, online http://Wikipedia.com, http://en.wikipedia.org/wiki/Alexander_Gordon,_1st_Earl_of_Huntly. [S925] George Seaton, A History of the Family of Seton, page 27. [S746] Wikipedia, online http://Wikipedia.com, https://en.wikipedia.org/wiki/Alexander_Gordon,_1st_Earl_of_Huntly. Biography*: William Crichton, 1st Lord Crichton (died 1454) was an important political figure in the late medieval Kingdom of Scotland. 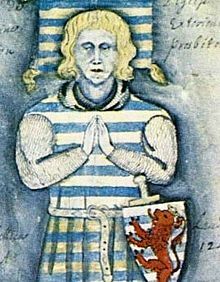 The son of Sir John Crichton of Crichton, William Crichton is first attested to as one of the Scots noblemen and gentry who were given safe passage into England to meet James I of Scotland, following the latter's release from captivity. Crichton was one of eighteen gentlemen to receive the honour of knighthood at the coronation of King James on 21 May 1424, and was made a Gentleman of the Bedchamber. In 1426, Crichton, described as a knight of the royal chamber, along with William Fowlis, the royal almoner, and Thomas de Cranston, King's squire were sent as envoys to the court of Eric III of Norway, to negotiate a continuation of the peace between their respective countries. Upon his return he was appointed governor of Edinburgh Castle, Master of the Royal Household and by 1435 Sheriff of Edinburgh. In 1437 Crichton, as Keeper of Edinburgh, had control of the six-year-old James II and by 1439 had himself proclaimed Lord Chancellor of Scotland. During the King's minority, Archibald Douglas, 5th Earl of Douglas was Regent. At his death Crichton and Sir Alexander Livingston fought to overthrow the power of the Black Douglas family. In 1440 they invited the 16-year-old William Douglas, 6th Earl of Douglas and his brother to dinner in Edinburgh Castle, and murdered them, despite the young King's pleas for their lives. This brutal incident of murder and betrayal of hospitality has become known as the ‘Black Dinner’ and was an inspiration for the famous "Red Wedding" massacre in the Game of Thrones series. Crichton was sent in 1448 to the continent, accompanied by the Secretary of State, John de Ralston Bishop of Dunkeld and Nicholas Otterburn who would latterly assume that position. The purpose of this embassy was not only to ratify the Auld Alliance between Scotland and France, but to try to find a bride for the as yet unmarried King James. Crichton and his company proceeded on to the Duchy of Burgundy, where they negotiated with Duke Philip for a suitable match for the King. Mary of Guelders, daughter of Arnold, Duke of Guelders, and niece of Duke Philip was chosen. Crichton escorted the future Queen back to Scotland, where they landed at Leith on June 18, 1449. In 1450 he made a considerable loan to James II. He also invested his wealth in Crichton Castle, adding to it and transforming it into an impressive courtyard castle. William, 1st Lord Crichton died before July 1454. [S746] Wikipedia, online http://Wikipedia.com, http://en.wikipedia.org/wiki/William_Crichton,_1st_Lord_Crichton. Biography*: He was appointed Knight in 1424. He held the office of Governor of Edinburgh Castle in 1426. He held the office of Master of the King's Household in 1435. He held the office of Chancellor [Scotland] circa 1437. In 1440 he allied against the Douglases, including the judicial murder of the 6th Earl of Douglas. He was created 1st Lord Crichton [Scotland] between 1443 and 1447. In 1444 he was outlawed and forfeited. Before 1447 he was restored to his lands and office. Biography*: Henry V the Blondell (1216 – 24 December 1281), called the Great, was the count of Arlon from 1226 to his death, lord of Ligny from 1240 to his death, count of Luxembourg and Laroche from 1247 to his death, and the count of Namur between 1256 and 1264 as Henry III. He was the son and successor of Waleran III of Limburg and Ermesinda of Luxembourg. In 1226, following the death of his father Waleran III, Henry inherited the county of Arlon. In 1240 Henry married Margaret of Bar, daughter of Henry II of Bar and Philippa of Dreux who was the great-granddaughter of King Louis VI of France. Henry's marriage to Margaret brought him Ligny-en-Barrois as her dowry, though, by a clause in the marriage contract, it remained under the feudal suzerainty of the county of Bar. In contempt of this, Henry paid homage in 1256 to Theobald II of Navarre, in his capacity as Count of Champagne. Henry's brother-in-law, Theobald II of Bar, took advantage of the conflict then raging between Frederick III of Lorraine and the bishops of Metz. Henry V was a partisan of the duke and so Theobald took the side of the bishop. Henry was captured in battle at Prény on 14 September 1266. On 8 September 1268, King Louis IX arbitrated between the two counts and Henry was freed and repossessed of Ligny, but under the suzerainty of the Barrois. Henry inherited Luxembourg and Laroche following the death of his mother, Ermesinde, in 1247. In 1256, Henry seized Namur while the reigning margrave, Baldwin II, was also reigning emperor in Constantinople. Baldwin relinquished his rights to Namur to Guy of Dampierre, Count of Flanders, who retook the margraviate from Henry. The two parties made peace and Guy married Henry's daughter. Biography*: Waleran III (or Walram III) (c.?1165 – 2 July 1226) was initially lord of Montjoie, then count of Luxembourg from 1214. He became count of Arlon and duke of Limburg on his father's death in 1221. He was the son of Henry III of Limburg and Sophia of Saarbrücken. As a younger son, he did not expect to inherit. He carried on an adventurous youth and took part in the Third Crusade in 1192. In 1208, the imperial candidate Philip of Swabia died and Waleran, his erstwhile supporter, turned to his opponent, Otto of Brunswick. In 1212, he accompanied his first cousin Henry I, Duke of Brabant, to Liège, then in a war with Guelders. Waleran's first wife, Cunigunda, a daughter of Frederick I, Duke of Lorraine, died in 1214 and in May he married Ermesinda of Luxembourg, and became count jure uxoris there. Ermesinda claimed Namur and so Waleran added a crown to his coat of arms to symbolise this claim. In 1221, he inherited Limburg and added a second tail to the rampant lion on his arms. This symbolised his holding of two great fiefs. In 1223, he again tried to take Namur from the Margrave Philip II. He failed and signed a peace treaty on 13 February in Dinant. He then took part in various imperial diets and accompanied the Emperor Frederick II into Italy. Returning from there, he died in Rolduc. [S746] Wikipedia, online http://Wikipedia.com, http://en.wikipedia.org/wiki/Waleran_III,_Duke_of_Limburg. Biography*: Henry III (c.?1140 – 21 June 1221) was the Duke of Limburg and Count of Arlon from 1165 to his death. He was the son and successor of Henry II and Matilda of Saffenberg. In 1172, he fought against the Count of Luxembourg, Henry IV the Blind, and then his ally, the Count of Hainaut, Baldwin V. The environs of Arlon were devastated and the duke, overcome, had to recompense the Count of Luxembourg for the wrongs he had done him. In 1183, he supported the election of Fulmar as Archbishop of Trier. This was opposed by the emperor, Frederick Barbarossa. Henry had to fight his nephew, Henry I of Brabant in connection with the advocacy of the Abbey of Sint-Truiden. The Brabantine duke claimed the advocacy as part of his mother's dowry. An arrangement put an end to the war in 1191 and the Duke of Limburg became a vassal of the Duke of Brabant. The two dukes collaborated in the internal affairs of the region (Belgium). [S746] Wikipedia, online http://Wikipedia.com, http://en.wikipedia.org/wiki/Henry_III,_Duke_of_Limburg. Biography*: Waleran II (or Walram II) (c. 1085 – 1139), called Paganus meaning "the Pagan", probably due to a late baptism, was the Duke of Limburg and Count of Arlon from his father's death in about 1119 until his own twenty years later. He was given the Duchy of Lower Lorraine by Lothair of Supplinburg in 1128 after the latter's accession as King of Germany in 1125. He was the son of Henry, Duke of Lower Lorraine (1101–1106), and Adelaide of Pottenstein (Adelheid von Botenstein). Henry had been forced to yield the duchy to Godfrey I of Leuven on Henry V's succession, but had kept the ducal title. With the coming of Lothair, Godfrey was forced to yield it to Waleran. Godfrey was not willing to do so and war broke out, especially over disputes about authority over the abbey of Sint-Truiden. In 1129, Waleran and the bishop of Liège, Alexandre de Juliers, demolished Godfrey's forces at Wilde. His rule was actual from there on. Though Waleran and Godfrey eventually reconciled, Godfrey maintained, as Henry had, the ducal title. He married Jutta von Wassenberg sometime between 1107–10, daughter of Gerhard I, Graf von Wassenberg who died on 24 June 1151. 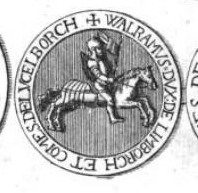 In 1129, Waleran was made forester of Duisbourg. In 1139, Lothair died and Waleran supported Conrad of Hohenstaufen, who was elected. He remained faithful to the new king until his death shortly thereafter. He was succeeded by Godfrey II of Leuven in Lorraine. [S746] Wikipedia, online http://Wikipedia.com, http://en.wikipedia.org/wiki/Waleran,_Duke_of_Lower_Lorraine. Biography*: Henry I (c.? 1059 – c. 1119) was the count of Limburg and Arlon from 1082 to his death and duke of Lower Lorraine between 1101 to 1106. He was the son of Waleran I of Limburg and Jutta, daughter of Frederick, Duke of Lower Lorraine. He opposed Egilbert, Archbishop of Trier, and took back some property which the former Countess Adela had given to the church. Egilbert summoned him to return them, but he refused and was excommunicated. Egilbert took up arms and seriously defeated him. As advocate of the abbey of Sint-Truiden, a title he had inherited from his father, he intervened in the internal affairs of the abbey. The abbot Herman, named by Poppo, Bishop of Metz, and supported by Godfrey of Bouillon and Henry, fell out with the Emperor Henry IV and the abbey was transferred to the authority of Arnold, Count of Loon. Arnold forced Henry and Godfrey to withdraw from the monastery. After many local nobles left on the First Crusade, among them Godfrey, Henry's power in the region of Belgica was greatly increased and he abused it, especially against the monasteries. The emperor intervened and took Limburg in July 1101. Henry was now forced to make submission and he was granted the duchy of Lower Lorraine, which Godfrey had abandoned on Crusade. As duke, he fell into competition with Godfrey I of Louvain. He demonstrated little in the way of loyalty to the emperor either. He joined Henry V against his father the emperor, but then turned back to the emperor's side. This was unfortunate for the duke, for the emperor died in 1106 and the partisans of Henry V attacked those of his father. The fields of Belgia were devastated, Limburg was taken, and Henry was imprisoned in Hildesheim. The duchy was transferred to Godfrey of Louvain. Henry later escaped and tried to retake Limburg and Lower Lorraine. He failed and made peace with the new emperor and duke. He continued nevertheless to employ the ducal title as "Duke of Limburg," the first of a long line. He also readily joined revolts against Henry V, fighting at the side of Lothair, Duke of Saxony at the victories of Andernach in 1114 and Welphesholt on 11 February 1115. He was succeeded by his son Waleran. [S746] Wikipedia, online http://Wikipedia.com, http://en.wikipedia.org/wiki/Henry,_Duke_of_Lower_Lorraine. Biography*: Waleran (or Walram) I (died 1082), called Udon, was the count of Arlon from AD 1052 and Limburg from 1065. He was the son of Waleran, Count of Arlon. He was also the advocate of the abbey of Sint-Truiden. The origins of his family are poorly known, he appears to have been a member of a collateral branch of the house of Ardennes, then ruling in Upper Lorraine. He may instead have been maternally related to that house. His mother may have been Adela, daughter of Duke Theodoric I.